Many customers are surprised just how quickly Junk King Fort Worth response to their junk removal needs. They understand how valuable your time off is and that it should be wasted waiting around for any type of service. 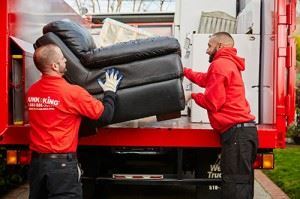 Most of the junk removal sessions set up by Junk King Fort Worth are completed within that first 24 hours. That’s great news when you are in a hurry to get rid of your unwanted clutter. Isn’t that exactly the kind of workers you should have around your home? When it comes to getting rid of your junk, Junk King Fort Worth is in going to mess around! This entry was posted in junk removal and tagged Junk King, junk removal, reviews on October 31, 2016 by Cody Rodgers. Last updated August 8, 2017 .